Ahoy, mateys! 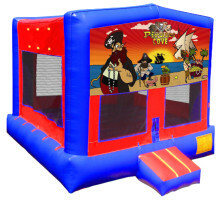 Take your party on an adventure to Pirates Cove with this terrific kid's bounce house. Here you will practice getting your sea legs as your party guests mimic waves and bounce around to their hearts' content. And for those with lady luck on their side, they might just be able to find some buried treasure.